Where rivers meet, you can be sure that people will gather in great numbers: to trade; to exchange stories, customs and traditions; to seek a common security — and to thrive. In Winnipeg, the city by the Forks, the rivers in question are the Red and the Assiniboine. And for thousands of years they came to the forks of these two prairie waterways — and they continue to do so. They come for many reasons: this is the gateway city to the Great Plains of North America; a place where perspectives change; where things begin anew; where strength of character and self-determination are bred in the bone. This is also where history, art, and culture are distinguished by turning points. I too came to Winnipeg, a city I had always known about vaguely, but for whatever reason was not sufficiently motivated to actually visit. But now I realize what I might have missed. Mea culpa Winnipeg. Somewhere between two and four billion years ago (give or take a few million), monumental planetary forces, tectonic shifts, and grinding glaciation created a landscape that today is the Red River Valley — stretching for hundreds of kilometres. At its heart’s core is Winnipeg. In many ways this tabula rasa and immense flat plain was the ideal canvas on which pivotal moments in Canadian history would be painted. It is a landscape of extremes in terms of climate, but also one on which both subtle and bold brush strokes can be applied. This is a landscape that has an inherent duality: formidable challenges and hard-won victories. And both reflect the sense of freedom engendered by this expansive, no-holds-barred, and unbounded land. The First Nations and Métis people came to know this emancipation well, and multitudes of immigrants from far and wide also discovered that in Winnipeg opportunity and freedom of expression take on a whole new meaning. This is a part of Canada where a unique sense of space and heightened perception were instilled in the landscape over a very long period of time. Imagine an immense body of water — the great Lake Agassiz — covering the almost 650,000 square kilometres of what today is Manitoba in the wake of the implacable but retreating glaciers. Then consider the ceaseless drainage of that lake until two principal rivers remained; each wandering at will across the vast lake bottom. What had originally been the North American craton — and this continent’s geological core — would become flat, boundless, and liberated terrain. And there at the geographical centre of North America, you will find the city of Winnipeg. Given the immense clearing away that these geological forces created, I am not surprised that what today is Winnipeg would become the great meeting place on the verge of the Great Plains as well as the breadbasket of North America. Anthropologically speaking, homo sapiens sapiens does tend to follow the trails of other species: bison, beaver, caribou. We are opportunists. And so to cut to the chase (the pun is intended), this continental corridor became the way and the means. And to some extent it was quite simple marketing, a kind of outsourcing. Abundant resources of course would mean continued westward expansion, colonization, the inevitable clash of cultures, a “national dream” of a transcontinental railway uniting east and west, a major rebellion, military might and the imposition of the forces of the state, a new northwest police force, and — despite boom and bust times — an economy that would eventually build a one-of-a-kind city on the Canadian prairie. And when you visit Winnipeg for the first time, I think there is no better way to get a full sense of this great flow of events than to do an orientation walking tour of first The Forks, and then the Grain Exchange District. At the former, you will come to a better understanding of the simple but significant importance of the confluence of the Red and the Assiniboine. And at a time when our cities are often struggling to regenerate themselves in order to avoid the trap of mindless megalopolis and retain a human scale in their communities, you will also learn a lesson in urban renewal at The Forks. Many cities have rediscovered their waterfronts and spent great sums of money to revive them in order that they become re-integrated into the city and — here again is the key Winnipeg theme — meeting places for citizenry. Well, Winnipeg has a waterfront too, and after much insightful design, money well-spent, and political commitment The Forks have been redeveloped in such a way as to be both an integral, people-friendly part of contemporary Winnipeg, as well as a tangible archive of western Canada heritage. A National Historic Site, The Forks is also a significant archeological site where evidence of aboriginal camp sites have been found from as long ago as 6000 BCE. In the 1700s, it was one of the most strategic locations in the West in terms of the fur trade. By the 1800s steamboats were making their way north from the U.S. By the 20th century it had become a large railway junction. But when new marshalling yards were built outside the city, the municipal authorities (and other committed citizens of Winnipeg) began to restore this very important site, as part of the revitalization of the downtown core. Also a National Historic Site, Winnipeg’s Grain Exchange District is another example of how a city can stay true to its architectural heritage and integrate it with some of the most stunning modernist architecture I have seen in my recent travels. Known for its terracotta and cut-stone architecture (and the exquisite details you will find everywhere you look in this core area of the city), Winnipeg at one point was nicknamed the “Chicago of the North” because of the “skyscrapers” built in the Chicago School style at the turn of the 20th century. As the economic and financial heartbeat of western Canada (because of its importance to the global wheat and other grains market), the Grain Exchange District is still home to some of the finest examples of this style of architecture. I say “still” because not only were they not torn down, but they have been restored and refurbished. For students of architecture, design, and urban planning especially (amateur or otherwise) the walking tour of the Grain Exchange District will reveal clearly why the “everything old is new again” principle of urban development is critical to the health and well-being of any city. And in the restored downtown area of Winnipeg, you will also get a lesson in the successful integration and juxtaposition of architectural styles. The slide show “Architectural Winnipeg” will, I think, prove my point. 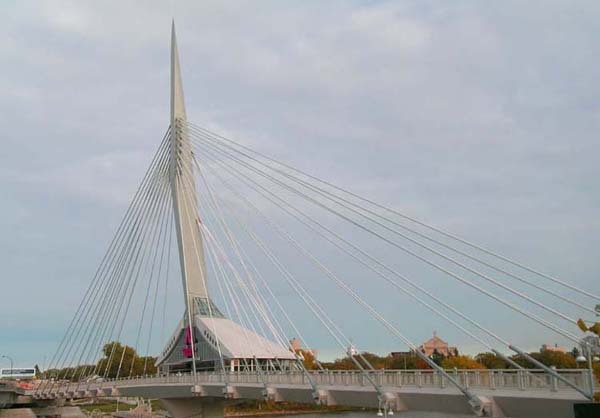 However, I want to draw your attention to one particular architectural gem in Winnipeg, and that is the Esplanade Riel Bridge (the image at the top of this page). Opened in 2004, the bridge links Winnipeg and St. Boniface but symbolically it also serves as an eloquent reminder of how this city epitomizes the cultural alliances and connectivity at the core of the Canadian “vertical mosaic.” As the historical evidence in Winnipeg manifestly shows, this part of the Canadian ethos is always a work in progress. I will leave it to a meteorologist to explain the climatic conditions that create the extraordinary light of this landscape, and how its quality and intensity amplify vision and perception. However, I must acknowledge its astounding clarity and the sense of spaciousness it produces in combination with a limitless sky and unrestricted topography. Landscape does indeed shape culture, and as numerous residents I interviewed suggested, this openness is a major element in the culture of Winnipeg. This is further supported by the fact that in Winnipeg today there are over 100 ethnic groups and over 80 languages spoken; and it is home to the largest concentration of French-Canadians west of the Great Lakes. I am also not surprised therefore that Winnipeg has become a major arts destination. There are so many stories to be told and no shortage of media in which to tell them. Whether you “read” the stories of Winnipeg through the medium of the visual arts, music, dance, architecture, or ethnography, you will encounter common themes and issues: the frontier experience; the struggle for self-determination; the validation of the alternative and individual vision; the collective sense of self; the intellectual courage to affirm universal concepts within a distinct and dynamic geographic context. And perhaps most importantly, Winnipeg is a clear illustration of why the arts are an industry that not only has a direct impact on “the bottom line” but also on the city’s quality of life. To sum up this part of my tribute to Winnipeg, I will borrow words from Thin Air: the Winnipeg International Writers Festival. (h) can change your mind. For more on the arts and Winnipeg, see the Recommended Websites below. Increasingly travellers (baby-boomers especially) are allowing themselves the luxury and time of engaging in historical travel, and exploring the universal issues inherent in the “stories” of other cultures. As the world, in one sense, has indeed gotten smaller and as global crises seem endless, travellers are getting some solace and perspective from the shared experiences they find in historical travel. Universal historical issues are very much part of the Winnipeg consciousness. As the gateway to North America’s “Last Best West,” Winnipeg is also the point of departure for exploring some of the most important historical events in Canadian history; history that did not happen without struggle and sacrifice. Born in what was then called the Red River Settlement, Louis Riel, “The Father of Manitoba” is one of the most important and controversial figures in Canadian history. Emerging as leader of the Métis people, he also was the leader — both spiritual and political — of the 1885 North-West Rebellion, which was a turning point in the evolution of this nation. He still provokes controversy today; described variously as a patriot, traitor, hero, freedom fighter, or mad man. This period of time in Manitoba and Canadian history is a complex one; very symptomatic of quintessentially Canadian “issues” and of the birth pangs of what today is a very multicultural nation. The Manitoba Museum of Man is one of the principal archival institutions in Winnipeg that is also full of narrative. Visually and aesthetically it has been deemed one of the best in the world. It is also a very interdisciplinary institution whose traveller-friendly displays will engage you on an intellectual, emotional, and philosophical level. This is one of those museum experiences that really make you ponder the nature of the human species. In addition, this is an example of the new breed of museum that creates thoughtful interaction, creating an awareness of the levels of human history and layers of meaning in “the last best west.” The dramatic and splendid mural of an Ojibway creation legend by First Nations artist Daphne Odjig at the entrance to the galleries is worth the price of admission in itself. As a city, Winnipeg is also an historic and heritage site of many different events. One of these was also a defining moment in Canadian history, the Winnipeg General Strike. These dramatic events (may 15 to June 29, 1919) would pit unionists against non-unionists, citizen against citizen, workers against media moguls and other power brokers, and ultimately the federal government against the strikers. As Joe Schlesinger, one of Canada’s most respected journalists has said, “History hurts.” And there have been painful moments in Winnipeg and Manitoba’s past — the Great Depression and the “Dirty Thirties” hit Winnipeg hard — but even these bad times had the eventual effect of creating a collective mindset that emphasizes self-determination and the rewards of hard work. Winnipeg also has always been fertile ground in terms of literature. One of Canada’s best known authors on the international scene is Gabrielle Roy. She is also one of the most recognized in terms of awards for her writing. Until recently she was the only Canadian writer to ever win the prestigious Prix Fémina. As a winner of Canada’s Governor General’s Award on three separate occasions and as the first woman elected to the Royal Society of Canada, she is one of our most prominent literary figures. Gabrielle Roy’s work is also highly autobiographical, blending the fine art of story-telling with her own personal experiences growing up in St. Boniface. And although she spent most of her adult life outside Manitoba, her writing always brought her home to tell the story of the French-Canadian and the Francomanitoban experience. She has legions of fans around the world for whom her childhood home in St. Boniface is a literary pilgrimage place. The house has been lovingly restored on Rue Deschambault. The street name is also the name of the collection of short stories (in English Street of Riches) that for decades has been studied widely in Canadian schools, especially by students of French as a second language. The prairie landscape and the immigrant experience in Canada’s West are principal themes in her work, but it is the intimacy of her style and narrative voice that has made her one of the most respected authors worldwide. For those of us who have a special place in our hearts for this profound writer, a visit to her home is also an experience in being chez soi. And as you can see, Winnipeg is also the point of departure for numerous meaningful travel experiences near and far in the province. For example, a day trip to the town of Steinbach to the southwest and its Mennonite Heritage Village will introduce you to another part of the Manitoba cultural tapestry. Winnipeg is also centred in a metaphysical sense: this is a city where an enlightened awareness of human society is both text and context. To view two short videos about Winnipeg, click on the links below. To view the slideshow “Architectural Winnipeg” click here. Yes … Winnie the Pooh gets his name from Winnipeg. The Man Called Intrepid (the inspiration for Ian Fleming’s hero 007) was William Stephenson; and born and raised in Winnipeg. Winnipeg is home to the Aboriginal Peoples Television Network, the first national First Nations Peoples television network in the world. The same architects who designed Grand Central Station in New York (Reed and Stern and Warren and Wetmore) designed Winnipeg’s Union Station. In 1970, the number-one top selling single in the world was “American Woman,” by Winnipeg’s The Guess Who. In part because of its cultural diversity, Winnipeg has one of the highest number of restaurants per capita in North America. You have a great country that’s why people continue to wish to come there. More power to you. thanks. This site might also help. Glad you’ve enjoyed time in our fair city, Bob. Thanks for pointing me to this post. Winnipeg and I seem to have a lot in common. Perhaps it’s a Gemini, too, as there is the serious side of hard work and enterprise mixed with a very strong cultural presence. We work hard and we play hard! Come and see us again soon, and next time, take time to come out to Manitoba’s Interlake. Just a hour from the city, but a whole world away.